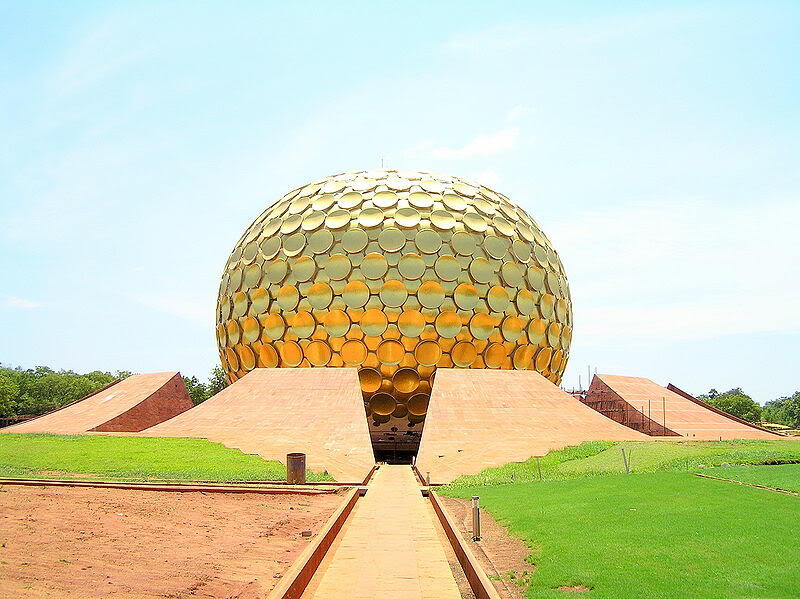 Next day, we left for Auroville, an international township, 14 kms away from Puducherry. It was a dream project of Mother, who wanted people of different castes, creeds and religions to stay together here. 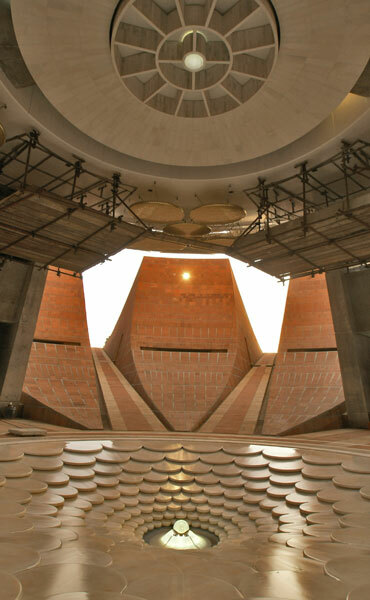 Matri Mandir is the spiritual centre of Auroville. It is in a dome shape. Soil from 126 different countries was placed in a pot here. As you enter, you see vast greenery all around. I was spellbound by the majestic and magnificent beauty. It can truly be one of the wonders of the world. Beauty of Taj Mahal, Eiffel Tower, etc is nothing as compared to it. Inside, there is a single beam of light that comes through and falls on the largest man made crystal donated by Zeiss, people who make spectacle lens etc. That is the only source to light up the whole thing. It passes through and reaches the bottom of the dome. There is a pin drop silence and it is said that meditating here, even for few minutes is very powerful. Everyone comes, sits quietly, meditates and leaves. It is immaculately clean. Everyone is made to wear new white socks. 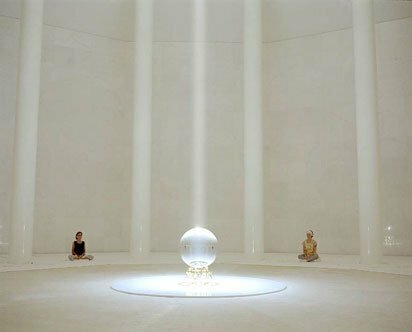 It is pristine white inside- silent, peaceful, quiet, neat and clean. The same single beam of light passes and comes down to the base of the dome, where there is Lotus pond. Lots of waterfalls and the way to go out. This is me and my son, before we embarked for Auroville. I wore an orange/peach saree and I was told that the sari looked the jogiya color (saffron color of sages) and absorbed the colors very well inside. I am wearing a Kota cotton sari- a gift from my sister. We reached early in Auroville and spent time in the Information Centre, where there are lovely boutiques to shop around, French Pizzeria, a video show to give you more information about the place. Puducherry and Auroville are a shopper's paradise. There are various handicraft shops. You buy convent embroideries, incense sticks, candles, potteries, pressed flower things, soaps, perfumes, oils, shampoos, garments, hidesign bags, belts. I would highly recommend shops like Kalki, Auroshikha, Casablanca, Splendour, Titatic. There are various small departments to visit. each specializes in its own thing. The bakeries are very famous. People here are very fit. There is a lot of emphasis laid on yoga. Everyone walks or rides a bike. Scooties and bikes are available for rent too. There are international standard full fledged gym and swimming pool facilities. There is a solar kitchen in Auroville and dining hall in Puducherry. Ashram guest houses are another options to stay. They are also very neat and clean. Puducherry is also dancer's hub. Tango is quite popular here. They have regular Milonga. It is also a photograph's delight. I saw photographers of many international magazines there, who had specially come with their complete paraphernalia and models and were shooting. The place is flooded with foreign tourists. I am really dying to visit this place now! The temple looks and sounds amazing. And I love the fact that everyone in the town does yoga, bikes, walks etc., it sounds perfect. Am I right in that some people also speak French there? Picture with beam falling on dome is not easy capture. Good job in capturing that. Subject is the key...and that is wonderful subject to capture. 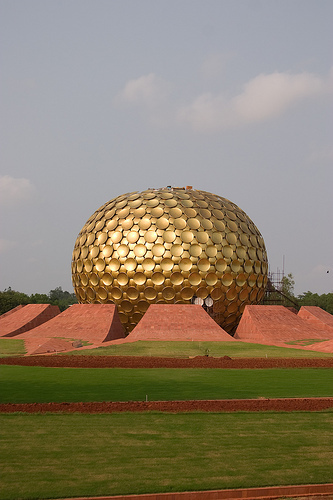 I have been to Puducherry,but didn't make to Auroville. Must make a trip after I shift to Chennai. I stumbled upon this post somehow and my first thought was hmmm she looks slightly older than her boyfriend and to my UTTER surprise,that is your SON! Oh my God!You have a face,skin and a body to die for.I am sure you've worked really hard for it and totally worth it. How do you do it all?I am subscribing to your blog henceforth :). Hi there, I also had been to Auroville and inside MatriMandir few days before, but I am suprised to see how did you get pics of this place inside... they generally don't allow u to carry the cam/ mobile right?